Flowers are a great way to brighten someone's day, celebrate with friends and family, honor those you love, and send well-wishes for nearly any holiday or occasion. Sending flowers is simply one of the best ways to show someone you care. But what if you don't care? What if, in fact, you'd like to send a completely different kind of message? Perhaps even a passive aggressive, vengeful, or all around negative message? Look no further. 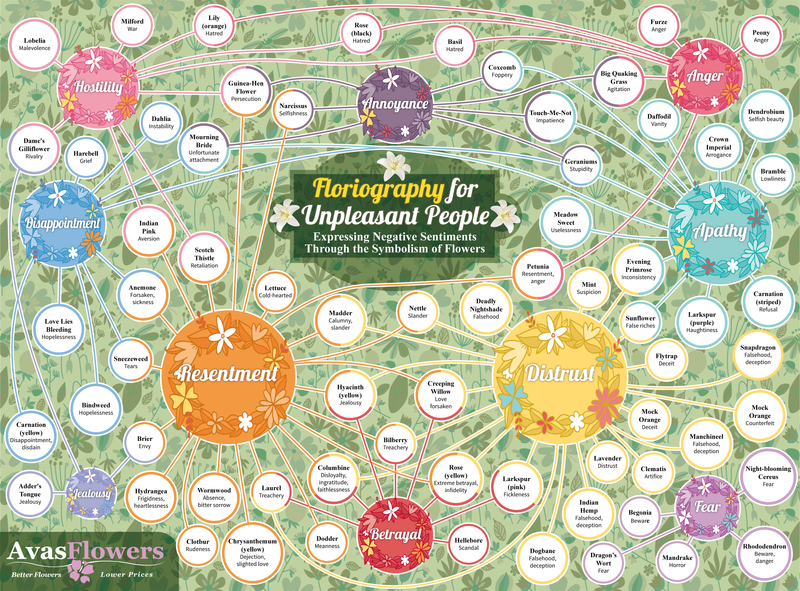 This infographic showcases 70 flowers to send to people who make you feel 10 common negative emotions including resentment, anger, hostility, betrayal, disappointment, annoyance, apathy, distrust, fear, and jealousy. If you'd like to tell someone how you really feel, send them flowers today.